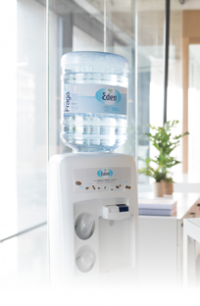 Eden Springs is a leading European provider of workplace drinks solutions, offering a complete, one-stop service to meet every organization’s water and coffee needs. Eden supplies integrated water and coffee service solutions to over 800,000 companies and homes in 18 countries. Solutions include a broad range of bottle-fed water coolers, plumbed-in water coolers and small pack bottles as well as hot beverages solutions including coffee machines, high quality coffee, tea and other accessories. Eden delivers over 710 MM liters of water, 43 MM coffee capsules and c. 450 tons of coffee to its customers’ employees and clients every year!